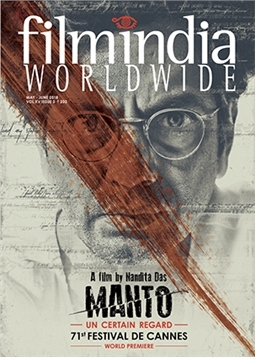 This year, India has a strong presence at Cannes with Nandita Das’ eagerly awaited ‘Manto’ in the Un Certain Regard section, and Rohena Gera’s debut feature film ‘Sir’ in International Critics’ Week. This issue spotlights India’s presence in the many avatars that rule Cannes: Official Selections, the Short Film Corner, the mammoth Marché du Film with its Industry Workshops and the Producers Network. The India Pavilion at the festival offers its hospitality and workspace to all those in Cannes who want to reach out to India and its cinema. In addition, this issue has news on Indian films at upcoming festivals, an interview with maverick producer Shaji Matthew, films to look forward to, and Saibal Chatterjee’s update on Bollywood.